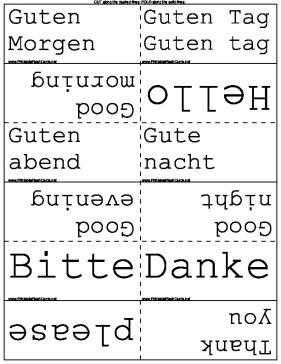 These flashcards cover many basic German phrases, such as hello and goodbye. If you're starting German classes or planning a trip to Germany, these flashcards are perfect for you. Du sprichst deustch, nicht wahr? You speak german dont you? Gut,danke,und dir? Fine thanks and you? Wo wohnst du? Were do you live?